Nikki Wheatley had 14 points, 10 rebounds and four assists to lead UNLV past Mississippi 64-57 in the title game of the Lady Rebel Round-Up on Sunday at Cox Pavilion. Dakota Gonzalez, Brooke Johnson and Paris Strawther scored 12 points apiece for the Lady Rebels (5-0), who won their home tournament for the first time since 2005. After seven ties and four lead changes in the first half, Ole Miss (5-1) led 33-31 at the break and built the lead to 38-33 before being held scoreless for a 3:24 stretch of the third quarter. Madinah Muhammad scored 24 points for Mississippi, which held a 42-28 edge in rebounds. The Rebels (23-7) were one of three Mountain West teams to gain a bid in the NCAA Tournament, joining league champion Boise State (25-6) and Colorado State (21-8). 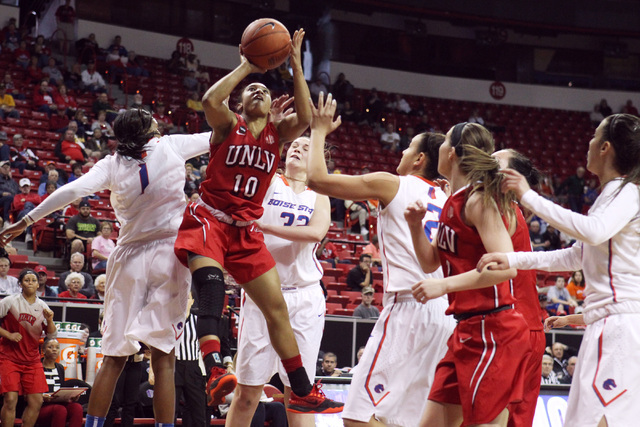 UNLV opens play against Utah (20-11) at 4 p.m. Friday in Provo, Utah. With a win, the Rebels would face the winner of the match between host Brigham Young (27-3) and Princeton (19-4) at 6 p.m. Saturday.